From Monday to Thursday you’ll be hands-on with the day to day care of the elephants. You will assist with providing food and water, mucking out and helping to bathe them – great fun ! You’ll learn to work with the villagers to plant and harvest the crops needed to sustain the elephants’ vast appetite. You’ll also learn to safely ‘walk’ your elephant for daily exercise. As a guest and temporary member of the community we encourage you to interact with the villagers. You may be able to assist with maintaining the village – basic repair and renovation work - as well as joining in with community activities. All the time you’ll be supported by a dedicated English speaking member of the team. You’ll have the opportunity to learn to cook some delicious Thai dishes and be invited to give alms to the local monks. In the afternoons, the team will arrange some fun and relaxing activities such as swimming or a kayaking. You may even catch a fish or two after learning the traditional techniques as well as learning to make your own paper from elephant dung - nice! Upon the completion of each project week you’ll return to Surin City; either to prepare for a relaxing weekend in the town or as preparation for your onward travel. Day 3 (Sunday) This morning we head to Surin, usually by train (sometimes bus), a journey of up to 7 hours through the Thai countryside. Thailand’s trains are slow but full of character making the journey an experience in itself! On arrival in Surin, we’ll check in to our city accommodation with time to explore this great regional city, where tourists remain a novelty and are often met with a warm welcome. Days 4 to 7 (Monday to Thursday) On Monday morning we’re off to the elephant village, in the countryside outside Surin city. 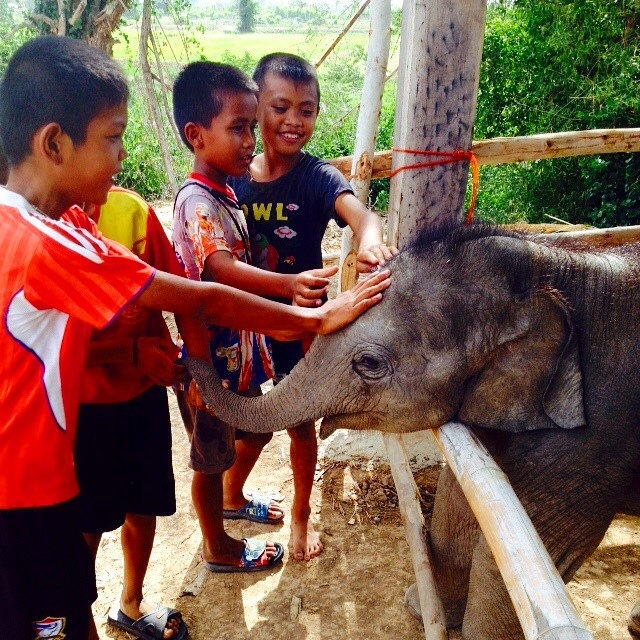 Here at the village you’ll live alongside the local people and of course the elephants. On Thursday afternoon, we return to Surin city, to the same accommodation as when you arrived. Days 8 to 10 (Friday to Sunday) Spend your free time as you please, your weekends are yours to enjoy and explore. Kick back and enjoy the charm and relaxed pace of Surin, the capital city of one of Thailand’s less developed provinces. Tourists to Surin remain a novelty and are often met with a warm welcome. Surin is a fairly laidback town with a small but interesting night market during the week. At weekends, the pace picks up with a livelier night-life to explore – there are dozens of great places to eat, plenty of bars and even a few clubs to check out. Our Surin the team will recommend the best places to go and you’ll find the cost of living pretty cheap by our standards with a meal as little as $3-4! If you’re lucky, there may alos be events such as Muay Thai exhibitions, concerts or festivals such as Songkran or the Elephant’s Buffet. If you’re feeling adventurous, then neighbouring Cambodia and the bucket-list temple site of Angkor Wat is within reach and well worth the effort. As are the idyllic white sand beaches of Koh Samet island or the lush national park of Khao Yai. Just ask our team to help you plan your weekend adventure. Subsequent weeks follow the same pattern as week 1 – head out to the village Monday morning, dive into village life getting to know your hosts (big and small, 4 legs and 2) ever better, then back to the city Thursday afternoon for weekend adventures ! Your last day (Friday) – goodbye, we’ll miss you! Oh no …… no matter how long you’re here for, one of these Fridays it will be time to say goodbye to your newfound friends. Our team will gladly help organise your onward travel from Surin, just save some baht to pay your bus or train ticket locally. There are heaps of options to Bangkok or to the Cambodia border, and even a direct bus to Chiang Mai if you’re travelling north. If it is time for home then try and book a late pm flight for Friday - if you’re in a hurry and/or need to catch an earlier flight on Friday, then there is an overnight VIP bus from Surin the night before which gets you to Bangkok in the very early hours of Friday. In Surin City (Day 3, then Thurs-Sun weekly) your home will be our team houses which are rented from the local community in a great location. Rooms are fan-cooled and hostel-style and bathrooms are shared. There is a kitchen with fridge so self-catering is an option if you prefer. Free access to wifi is provided, though don’t expect reliability or lightning speeds here in the provinces. At the elephant village, accommodation is a local family homestay, basic but clean and comfortable. You will live ‘Thai style’ sleeping up to five a room on floor mattresses. Fan-cooled rooms have mosquito mesh windows to keep the bugs out, and shared bathrooms have cool showers. There is a shared kitchen where our team will help you prepare some delicious meals. No wifi here. Surin enjoys a tropical climate – hot and humid all year round with daily high temperatures always in the thirties. The monsoon season runs from late April to mid October – many days during this period extreme bursts of heavy rain, but as with most tropical storm periods it rarely rains all-day every day. Pack light clothing suitable for the climate, but ladies please avoid exposing too much skin whilst at the village – this is a conservative, rural community where you should dress modestly with shoulders and knees to be covered please.